Repost from my hitherto forgotten blog on Google’s Blogger. I must have 5 versions of blogs across different platforms and it is the equivalent of screaming into the wind. Anyway, I’m in a Tully’s waiting for someone so I will write something about…something. One of the best shows on TV is definitely Hannibal and the books are equally as good, though I think that the books portray the Anthony Hopkins version while the TV series speaks more to me because of the excellent cast, especially Mads Mikkelsen. 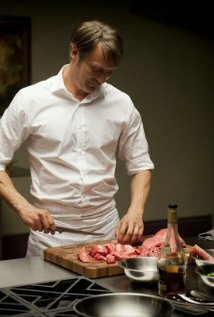 In a nutshell, Hannibal is a the fusion of passion, steel, love, and desire. A keening want that exists in all of us. To be heard and to be special; to be remembered even though we know that dust and air are our ultimate destination. It’s the grisly now that holds us in awe and keeps oblivion well away. Great post by Hettienne Park who played Beverly Katz on Hannibal. She is a good actress and a great professional who addresses important issues in television as well as the creative process behind the show.